It was Maestro Kent Nagano’s long-held dream to add an octobass to the OSM’s already impressive roster of instruments. It was thanks to his initiative that Canimex, a company from Drummondville led by recognized patrons of classical music Roger and Huguette Dubois, acquired and imported this unusual instrument from Europe. 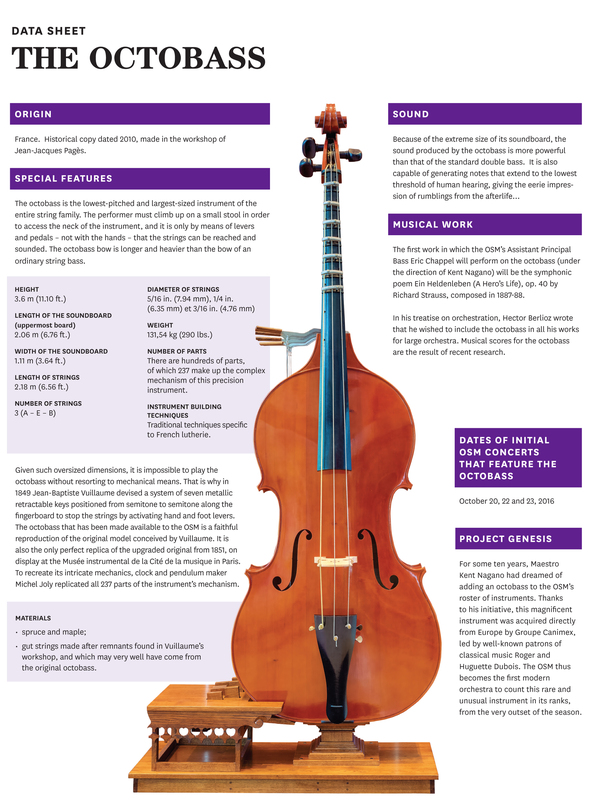 The imposing octobass, measuring 11 ft. 10 in. (3.6 m) in height, is made up of hundreds of different parts of which 237 form a complex mechanism. The instrument’s pedals are arranged on a stand, which also serves as a platform upon which the octobass player is positioned. In addition, a system of levers enables notes to be sounded on the fretboard, which actually lies beyond the instrumentalist’s reach. Thus, the octobass player’s hand and foot must simultaneously move with the friction of the bow on the instrument’s three strings. Of the three known octobasses throughout the world, only the one that today graces Montreal’s Maison Symphonique is perfectly functional. What is more, the instrument is a unique historical replica of the original, dated 1851, and displayed at the Cité de la musique-Philharmonie de Paris. The OSM is, therefore, exceedingly proud to be the only orchestra in the world to use and make this amazing instrument known to the public.